Do you remember when Nicholas Negroponte revealed the string generator mock-ups at the "AMD Global Vision Conference" in September? 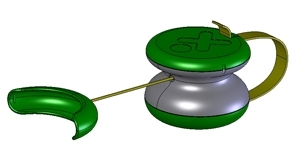 Users will be able to operate the generator in a variety of ways, including holding the device (the size of two hockey pucks) in one hand and pulling the string with the other, or clamping the generator to a desk, attaching the string to one foot, and using leg power. To reach the project's goal of one minute of power generation for every ten minutes of laptop use, the generator would need to produce 20 watts (the laptop will require less than two watts in a primary application as an electronic textbook replacement). Ray Rahman, VP of Business Development has extensive financial, operational and technical experience having worked for Lehman Brothers in the fixed income. His total product exposure has been over $100 billion. [...] He is one of the principal architects of the world’s first microcredit securitization. Compared to a crank, Potenco generates 5 times more power, it can be pulled 5 times longer before the user senses fatigue; it's quieter, lighter and more robust. One minute of pulling gives 1 hour of light, 25 minutes of talk time on the phone, 230 minutes of iPod shuffle use, 45 minutes on the Nintendo DS. And how many minutes of OLPC Children's Machine XO type-time? 1st of all thanks for posting and responding to my skepticism! - I respect your openness and angle. I'm interested that OLPC's stance on DRM is so strong; yet when it comes to the power supply the philosophy of open source disappears "Potenco has developed a patent-pending portable power generator". Was it impossible to stretch the not for profit approach beyond the software? Gideon - There is still the hope that the patent could be released to a patent commons or that Potenco will promise not to sue certain classes of people/organizations who want to fiddle with it. While the US is primarily a first-to-invent, many countries are first-to-file, and even in the US you have to present strong evidence that you had a working invention before the "other guy," which means a costly legal process. All of this is just to say that patents are a necessary evil (to paraphrase Adam Smith), and it's what you do with the patent that is important. NTP's approach with Blackberries would be the least favorable route, IBM's patent commons for Linux would be the best. Some really great technology here. However, I still want to know, how does the electricity get to the laptop? Is there a plug on one side for a cable? And how wide is the cable, what is it covered with, and how long is it? What if you mount this to a "hometraining-bike", and to a bigger generator, does it have potential to light up a room (one or two lowenergy-lamps) in a house for lets say.. 2 hours? Or if there is like 10 generators, and 10 switches on the bicykle, and while training filling up one generator after the other to have free light for a whole day? Is that too optimistic? Please.. I want an answer. Great questions! Once Potenco moves past nice CAD drawings we will all have a better idea of how it works and its alternate applications. Glover mentions powering lights (appliances?) in a room or house from the Potenco device. I'd be more likely to believe the device is suited to smaller powered devices like the OLPC laptop and not powering lights in a house. The typical light is (in terms of filament globes) around 60 watts. Fluorescent globes are becoming more popular and typically use 15 watts for the same output. Although this does give rise to an idea I had about designing cheap Wind Turbines for rural villages. Traditionally wind power is a hit-and-miss technology due to wind variations and is always paired with battery storage and quite often solar as a secondary power source. An invertor is also needed to provide AC at the required voltage for distribution to community members. In the typical non-powered village no houses would be pre-wired for power so I would expect extra wiring costs for each house. This may be as little as one power outlet per house or up to one per room. Maybe some of the OLPC strategies could be aimed at those technologies for not just powering a room or a house but whole communities? Will this string generator be able to charge standard size batteries as well as the OLPC? If it can charge cell phones, AAs and D cells then it will be invaluable throughout the developing as well as developed world. "or clamping the generator to a desk, attaching the string to one foot, and using leg power." This idea of leg power is extremely attractive. During computing, legs are idle or energetically tapping and bouncing. A string/cord/strap that connects the ball of the foot to the knee and harnesses the available 2 to 5 cm (1 to 2 inches) of movement under 100 to 200 Newtons (20 to 40 lb.) of tension would input 0.3 to 1.4 miliwatt-hours per pull, or 4 to 20 Watts continuously. All without interrupting computing time. Like a treadle sewing machine. You don't have to go too far back in time (or too far from my front door) to see "idle" feet being put to work in Kenya. Most of the seamstresses and roadside tailors here in Kisumu use treadle-powered Singer sewing machines. Indeed, you can still buy these new; Chinese manufactured machines are sold in the local Nakumatt, Ukwala and Yatin supermarkets. I heard a rumor that the yo-yo generator is generating less than 10W average. They seemed to have modified the specs to read 20W peak. Their earlier specifications maintained that they could get up to 50Watts peak. Does anyone know what is happening? Is the <10W rumor a misleading statement? It is possible to generate 20W (average) with a "pull-rope" generator. I have experimented with various manually operated generators, for a hand cranked defibrillator, including one with a pull rope and have been able to extract 20Watts (average). Therefore there is an existence theorem that the power required for the olpc can be achieved with a generator such as the yo-yo generator. The maximum aerobic power of children is some multiplier of their Basal Metabolic Rate. This is some well known fuction in physiology, but I can't find the pultipler factor. Potenco claims that their generator adapts to the pull-strength. The child could generate lower power. The maximum power requirement for the olpc is 2 Watts. Anything over that, I assume, will be stored in the batteries, when the laptop is operational. Voltage in a generator is proportional to the RPM and the Torque (pull force) is proportional to the current. Therefore the same power can be generated by different RPM, torque products. It may be easier to generate more pulls per second with a lower torque depending on the strength and stamina of the individual. What was to hand-pull defibrillator generator you used. I'd be interested to see those specs. Thanks! The generator was constructed using a Mabuchi brushed motor (550 series) My postings in this forum are specifically for the olpc and not to advertise my defibrillator. However, some of the principles used in the power supply for the defibrillator (20Watts surprisingly) can illuminate the design considerations for a manually operated power supply. The potenco generator seems to be interesting as it is brush-less and compact. A generator that is robust and less than $10 for generating 20 watts is intriguing.and holds great promise for medical devices in rural areas. i have but one question; where can i get one?? potenco's website doesn't seem to sell them. am i correct in assuming that they are not on the market yet? will XO laptops sold through the give one get one programe ship with one?? i ordered my XO a couple of weeks ago, it has not yet arrived, but when it does, i want to power it with my muscles.